Get out and enjoy the landscape–any way you can! At the village center, the Ladd Field is the site of a soccer field and baseball diamond. The Ladd Field Committee has plans to revamp the basketball and tennis courts, and to develop other uses for outdoor fun. The field has been used in the past for Fourth of July celebrations inculding fireworks, food vendors, tented displays by community groups, and various entertainment for the whole family. The GMC (Green Mtn. Club) asks hikers to stay off of the Worcester & Hunger Mountain trails from April 15th to Memorial Day to help control erosion. This trail is 2.5 mi. to the summit with 1900 ft. elev. gain. It climbs the west side of Worcester Mtn. Remember that the sun falls behind the ridge by late afternoon. Start during A.M. hours for maximum light. Directions to trailhead: From Worcester Villige (0.0 mi). Left on Minister Brook Rd. Right at four corners on Hampshire Hill Rd. (1.5 mi.). Continue straight, bearing left on Mountain Rd. (4.0 mi.) to trail parking (4.1 mi.). Worcester’s dirt roads offer scenic though often steep mountain biking. In the warmer months, some residents commute to Montpelier (9 miles) along Route 12. For road bikers, Route 12 through Worcester is part of a popular 60-mile loop that connects Montpelier, Middlesex, Stowe, Morrisville and Elmore. Lake Elmore – 9 miles north of Worcester. Wrightsville Reservoir – 4 miles south of Worcester. 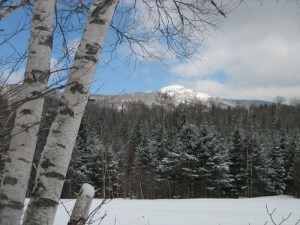 The trail network of Vermont Association of Snow Travelers (VAST) trails passes through Worcester. The Worcester Rangers are our local VAST club.